Make sure tail head area of cow is clean and free of any loose hair. Apply a paint strip, approximately 15cm in length and 3-5cm wide, along the spine in the same direction of the hairgrowth of the tail head. Additional coats may be applied and will aid performance of product. The paint is rubbed off by crumbling and hair will stand on end when standing cows are mounted, a clear indication of Estrus activity. BOViPAINT™ will remain on cows that have not cycled – duration subject to conditions and correct application. 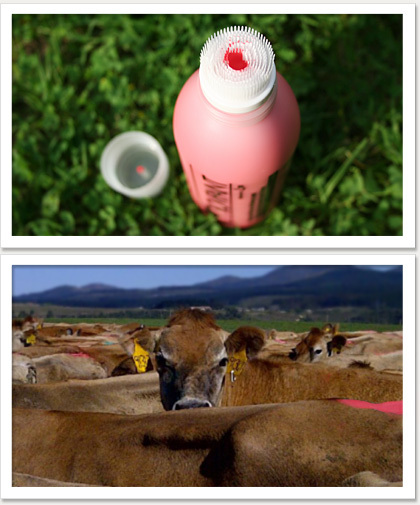 HEAT DETECTION AID – applied to Dairy Cattle prior Artificial Insemination. The paint is painted on the tail-head (top end of tail) section of the cow in a 15 x 3-5cm strip. When the cows mount each other (this is a sign that the standing cow is in Heat), the paint will be rubbed off by crumbling and hair will stand on end, thus a sure sign that the cow is on Heat (in Estrus) and ready for Artificial Insemination. GENERAL MARKER – can also be used during non-mating season as general marker on cattle, e.g. marking of dates, numbers, medicated cattle etc.